With my new Amazon Kindle and a Kindle Unlimited plan, I have finally started to explore books for their interesting title and synopsis. So far, I've only been reading bestsellers and books recommended by friends/social media/bloggers etc. "The cozy life - Rediscover the joy of the simple things through the Danish Concept of Hygge" by Pia Edberg belongs to the former category. I found the concept intriguing and it aligns with my belief of leading a simple, happy life without materialistic pursuits. 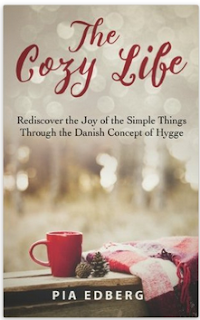 As the author defines in the very first page, Hygge is the Danish concept of coziness. "the art of creating warmth, comfort and well being through connection, treasuring the moment and surrounding yourself with things you love." Many examples in this book took me back to my childhood days when days weren't rushed. I was outdoors most of the time - playing and enjoying the sunshine, eating a meal together with family, watching the stars at night, sleeping on the terrace during summer nights, celebrating festivals in a simple, traditional manner etc. "Being constantly busy actually hampers our imagination, while boredom and idleness actually help invite inspiration, despite what society may tell us"
If you are looking for ways to slow down, relax and enjoy life outside the digital world, I highly recommend this book.